A tale of good karma. My cousin Marnie and I weren’t particularly close growing up. This was a function of age and geography—I was the oldest of the grandchildren and Marnie was somewhere in the middle, running with the gaggle of the few girls in our boy-heavy clan. Early on, my father had moved his young family to Boston from his hometown of Binghamton, the furthest away from his brothers and sister, and so our paths didn’t cross as often as the other cousins’. When they did our four-year age difference often found me playing fierce games of Euchre with the aunts and uncles, while Marnie was trading secrets with the younger girls. But as we grew older, got married, had kids, the years that had separated us evaporated in the sunlight of our common experiences. We saw each other every year or so at weddings and family reunions, commenting happily about the growth of each other’s children, trading stories from the trenches of motherhood. I suppose we might have continued to glide along separately in the river of our numerous relatives, but Marnie makes that extra effort to connect, folding you into her friendship and spitfire humor as if you’d been there all along. I saw her most recently at a baby shower for her youngest sister, Katie. The place was packed with Katie’s friends whom I didn’t know, so I stuck with Marnie, certain that she would make it fun and have some interesting stories to tell. 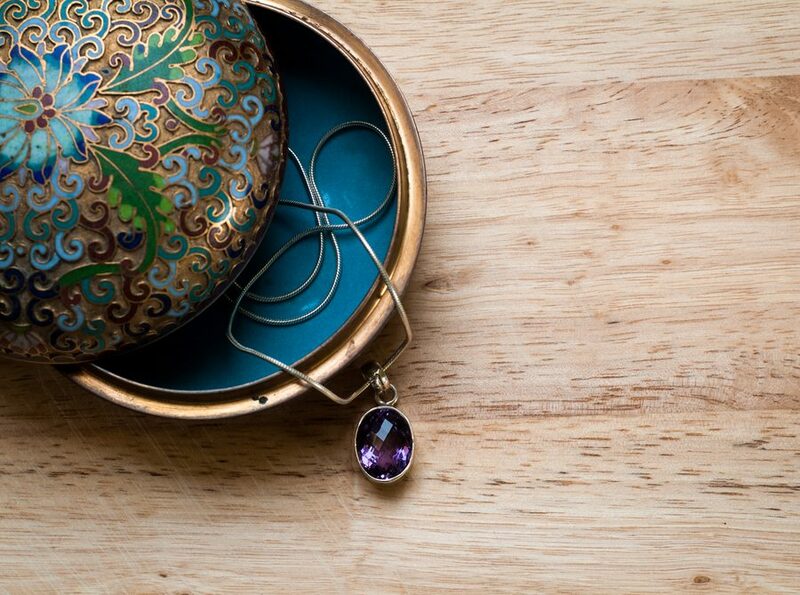 The necklace she wore that day was unusual, a purple stone decorated with a silver Celtic knot. It’s just the kind of thing I like—purple, my favorite color, the silver knot simple but meaningful to our Irish heritage. It was twisted, and I leaned over to untangle it for her. “This is so pretty,” I said. She took it off and handed it to me. “It’s good karma,” she insisted. Well, who could argue with that? I thanked her profusely, a little embarrassed that I wasn’t wearing a necklace I could give in return. A few days later, I picked out a necklace of mine that I thought she’d like, a swirling black and red pendant that would go well with her dark hair, and included a note: “As a wise woman once said, ‘It’s good karma.’” It had never occurred to me to hand off my jewelry to someone just because they liked it, and it felt good to follow her lead. I smiled as I put the necklace in the mail and assumed the story was over. I called immediately and learned that a week or so before, she’d taken a walk with two of her kids, teenagers Maggie and Jake. They’d spied some jewelry in the brush by the side of the road—a bracelet and a necklace. Jake, an enterprising young man, suggested they hock the items. “No way,” Marnie told them. “It’s the karma from the necklace I gave my cousin.” She then used the teachable moment to expound on the importance of generosity, of being a giving person in this world, and how what goes around comes around—though usually not quite so quickly. When they got home from the walk, the package with my necklace had just arrived in the mail. Marnie had a different idea, though. She brought the jewelry to the police station. It was a long shot, of course. Who could say where the items had come from, and if the rightful owner could ever be found? Marnie forgot about it until the day she called me. “A woman just came to my door with a bouquet of flowers and a gift certificate to go out for dinner!” she told me. Apparently the woman’s house had been robbed, and all her jewelry stolen. The bracelet had nine stones on it, one for each of her children. But the necklace was even more meaningful. It had been given to her by a daughter who’d since died. Usually the police don’t give out the name and address of someone who drops off a lost item, but because Marnie’s husband is on a nearby police force, the local police know him. They were willing to bend the rules so that the woman could deliver her thanks. Were it not for their looking the other way, Marnie would never have learned the rest of the story. It makes you wonder how often a little gesture or effort we make ripples into something far more meaningful, without our ever knowing. Marnie and I shared a laugh over that one. We both know how rare it is to do anything “right” in the eyes of your teenagers. And I think of her every time I do. I think about her warmth and generosity, and her willingness to make the extra effort to reunite a stranger with her belongings, never knowing if any good would come of it. And it reminds me to notice those often small, easy-to-miss opportunities to cause a ripple that somewhere down the line, whether we ever learn of it or not, might turn out to be an ocean of good. 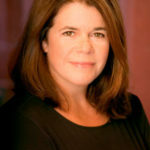 JULIETTE FAY is the award-winning author of three previous novels: The Shortest Way Home, Deep Down True, and Shelter Me. She received a bachelor’s degree from Boston College and a master’s degree from Harvard University. Juliette lives in Massachusetts with her husband and four children. The Tumbling Turner Sisters, out in June 2016, is her fourth novel.